Lewis Bennett, 41, was taken into custody at the federal court house in Miami Tuesday morning on federal charges in the killing of Isabella Hellman, FBI officials said. Lewis Bennett has insisted he never knew what happened to his wife, who disappeared at sea last year during their sailing honeymoon. That is apparently about to change. 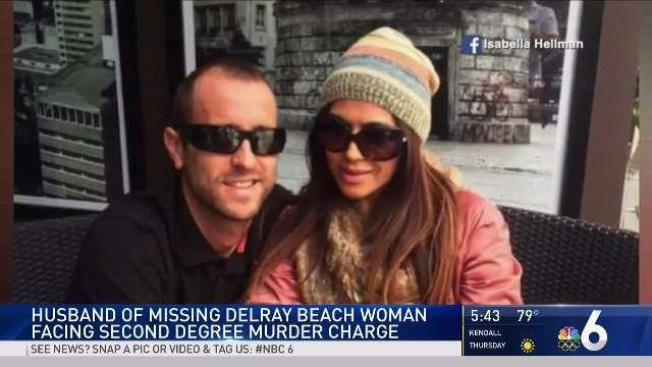 Court documents filed Friday in Miami federal court indicate Bennett, 41, has accepted a plea deal in the May 2017 disappearance of Isabella Hellmann, 41, who vanished in May 2017 as the Florida couple sailed off the Bahamas. The U.S. Attorney's Office filed a new affidavit charging Bennett with involuntary manslaughter, saying he killed Hellmann "without malice," and dropped second-degree murder charges. In turn, Bennett is now scheduled to change his not-guilty plea at a Monday hearing. Such activity typically occurs when a plea deal has been reached. Prosecutors declined to comment Friday and Bennett's public defender, Vanessa Chen, did not immediately return a call and email seeking comment. Hellmann's sister also declined to give an immediate comment. Bennett, a mining engineer with dual British and Australian citizenship, had told the FBI and British journalists that he and Hellmann, a real estate agent, took their 37-foot catamaran, Surf Into Summer, for a belated honeymoon Caribbean cruise after they had been married three months. They left their infant daughter, Emelia, with her family. As the catamaran passed the Bahamas on the return to Florida, Bennett sent out an emergency radio signal. When the Coast Guard found him on a life raft three hours later, he told rescuers he had left Hellmann on deck as he retired for the night to their cabin. He said he was jolted awake when their craft hit something. He said Hellmann was gone when he went outside and his attempts to find her failed. He said the catamaran was sinking, so he abandoned it. It was a story he repeated to the FBI and journalists. "I have got nothing to hide," he later told The Daily Mail, a British newspaper, adding Hellmann was "my soulmate." The Coast Guard spent seven days searching and found the catamaran, though it sank before it could be recovered. They did not find Hellmann. Sixteen days after the disappearance, Bennett went to the home of Hellmann's parents to get his daughter, a heated meeting that ended with her sister accusing him of killing Hellmann, according to a Boca Raton police report. He took Emelia to Great Britain, where she was last reported living with his relatives. Bennett visited Cuba, saying he hoped maybe Hellmann had been rescued and taken there. He soon filed a motion with the Florida courts asking that his wife be declared dead. That would have given him possession of the condominium and other items that belonged solely to her. A judge rejected it. Investigators long doubted Bennett's story. The FBI says an inspection of the catamaran before it sank showed portholes below the waterline had been opened and damage to the twin hulls appeared to have been caused from the inside. Also investigators found Bennett on the life raft with $100,000 worth of coins stolen from a yacht he had worked aboard in 2016. Bennett was arrested last year on that charge and pleaded guilty, getting a seven-month sentence. While serving that sentence, he was charged in February with Hellmann's death and has remained jailed. He faces a possible eight-year sentence on the involuntary manslaughter charge and deportation.